By the end of 2013, the total length of rural roads in Dunhua City has reached 1,553 kilometers, and the Tong Village rate has reached 100%. As far as the area of â€‹â€‹the city and the total mileage of rural roads are concerned, its security protection (hereinafter referred to as security) can be described as long front and heavy tasks, and how to make rural roads after transformation become the safety road for the majority of the people, and to secure the road and get rich. Road, with limited funds and limited personnel, will undoubtedly become another difficult problem facing the Dunhua City Government and the Dunhua City Transportation Bureau in the new situation. The shortage of conservation funds is a bottleneck affecting the safety and security of rural roads. The issue of rural road safety is not limited to the provision of signs and signs on rural roads, the installation of deceleration belts and other surface problems, and it may be a potential problem for the safe use of rural highways. Therefore, the specificity of rural roads is lower than that of national highways (low roadbed standards, narrow roads, and many curved roads). The maintenance and management of rural highways is the guarantee of rural road safety. Dunhua City began to carry out large-scale reconstruction of rural roads in 2004. It has been 10 years since then, and by the end of 2013, the mileage will be 1,553 km, and the construction fund will be 7.8 billion yuan. The city's construction funds constitute one-third of the country's subsidy funds (from the beginning of 2012 to three-fifths of the subsidy standards), and the rest are local support. Due to the shortage of local government financial funds, the Transport Bureau of Dunhua City has already borrowed more than 100 million yuan. From this we can see that in this case, there are certain difficulties in maintaining funds for 1,553 km of rural roads. At present, the conservation funds of Dunhua City mainly consist of 1.14 million yuan of state transfer funds. Jilin Provincial Department of Transportation and Yanbian Prefecture Transport and Transportation Bureau paid for 300,000 yuan each year under the conditions of conservation and subsidy. The actual funds for rural road maintenance are about 1.4 million yuan. According to the clear maintenance standards issued by the Jilin Provincial Communications Department in 2010 issued by Ji Jiao Jiao  No. 36 document, non-existent county-level highways are 5,350 yuan per kilometer per year (the State Council issued a notice in 2010 and implemented counties for county-level highways. The Dao County Administration no longer pays special funds for county-level highways. The local government has included county-level highways in rural roads for management and maintenance purposes. Township-level highways are 2,500 yuan per km per year, and village-level highways are 2,150 per km per year. yuan. In accordance with the above criteria, Dunhua City has 106.2 kilometers of county-level highways, 528.6 kilometers of Tongxiang Highways, and 1024.4 kilometers of Tongcun Highway. The annual routine maintenance funds are 4.09 million yuan, which is calculated according to the third level and the gap is 2.69 million yuan. Based on the local conditions, Dunhua City listed the security engineering of the county, township, and village roads as part of the maintenance program, and the funds required for the security project were paid out of the annual maintenance funds. Dunhua City's 1659km local roads are only used for supplements, additions, righting signage, milestones, deceleration belts and other security projects. The minimum funding is 350,000 yuan. Dunhua City has implemented rural road construction for 10 years and invested in rural road safety projects. The debt is over 4 million yuan. 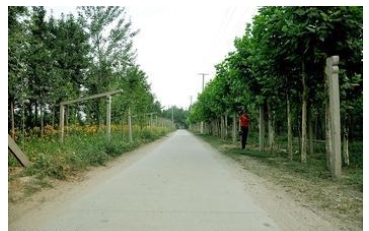 By the end of 2013, Dunhua City will achieve a 100% Tong Village rate, and at the same time the Tongcun rate will reach 100%, the first rural roads that have been rebuilt will also come to the maintenance cycle. To ensure the safe use of rural roads, the average annual time period will be Need to repair or rebuild up to 130 kilometers, the required budget for funds is more than 50 million yuan. The use of rural roads for overloaded vehicles has brought great risks to safe use. In recent years, along with the continuous extension of the transformation of rural roads in Dunhua City, road networks between villages, villages, townships, and townships have basically taken shape. Convenient transportation and transportation conditions have brought benefits to farmers while also providing large-scale evasive punishment management. Excessive overloaded vehicles have an opportunity. Due to the fact that the number of rural roads and highways in the Bureau is relatively small (at present, there are only two road officers and a law enforcement vehicle), the daily work is mainly focused on the care and handling of peopleâ€™s reports on key road sections. At the same time, normal road patrols are difficult to complete, resulting in the loss of new signs, signs of damage, and skewedness. Each year, only a single investment amounted to more than 100,000 yuan, and the vehicle overloaded and overloaded. It is very difficult to control effectively and some road sections are seriously damaged, which greatly shortens the service life of rural roads. At the same time, due to the narrow roads on the rural roads, ultra-wide and over-heavy vehicles have caused many uncertain security factors to the normal vehicles. Scraping, collisions, deaths, and injuries have occurred from time to time. The construction of vehicles for the project is more direct to the destruction of rural roads. At present, the Jilin-Hunchun high-speed railway and land consolidation project (the construction of the Hegang-Dalian expressway is about to start construction) is underway in Dunhua City. Dozens of tons or even hundreds of tons of transport vehicles have caused serious damage to rural roads. Nearly 300 kilometers need to be rebuilt. We attach great importance to actively taking effective measures to minimize insecurity. With the continuous reconstruction of rural roads, safety work has become a focus of social concern. At present, the most economical, convenient, and most-used modes of transportation in Dunhua rural areas are agricultural tractors and second-generation motorcycles. Due to the restrictions imposed by rural roads over the years, these vehicles are difficult to reach a certain speed on gravel roads, so the safety issue is not prominent. However, with the reconstruction of rural roads, the speed of these vehicles has been getting faster and faster, and the number of road accidents has increased year after year in rural road interchanges, rural roads and provincial highways. To this end, Dunhua Transportation and Transportation Bureau attached great importance to this phenomenon, and actively took effective measures to strengthen the security work. Since 2008, it has taken the lead in the implementation of maintenance and management of rural roads in Yanbian Prefecture. In 2009, it began to set up signage signs on reconstructed rural roads, established stone deceleration belts at the intersections, and increased the number of construction miles annually according to years. In 2010, the bulletin board was set up at the head of the township's village crossing in the city's rural roads, and the township maintenance management responsibilities (represented by the deputy director of the township and township deputy) were announced. The telephone number was disclosed; in 2011, various milestones and signage signs for rural routes were conducted. Refurbishment, righting, and addition; In 2012, with regard to the issue of warning signs on transit roads in rural townships and transit roads in villages and villages, the warning signs were set up to reduce insecurity to the lowest point.